50 Facts About Spider-man | Superhero etc. Hello internet, Nate here. So the last poll for this series in my 50 Facts about Deadpool, I asked you guys if you wanted to see 50 Spider-man facts or 50 Batman facts and Spider-man won! So here are 50 Facts About Spider-man! 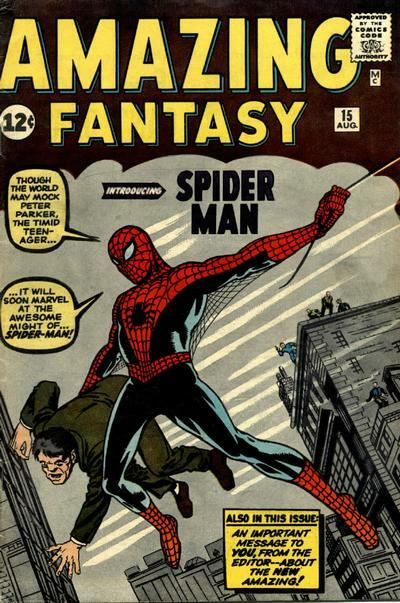 Spider-man was created by Stan Lee and Steve Ditko and debuted in Amazing Fantasy #15 in August of 1962. Stan Lee actually originally was going to go with a fly or insect before finally picking a spider to base the character on. Spider-man wasn’t Marvel’s first spider. A month before Spider-man’s first appearance, Journey into Mystery had a story involving a giant spider that was killed by the end of the story. Spider-man is the first teenage superhero to not be a sidekick of an adult hero. Spider-man’s quips that he makes in battle is used for him to distract his villains as well as make it easier for him to relax and not get scared. Stan Lee specifically placed a hyphen in Spider-man’s name to prevent “Spiderman” and “Superman” to be mixed up as Superman was rather popular at the time. Spider-man’s first solo title The Amazing Spider-man (Vol. 1) first appeared on shelves in March of 1963. Volume 1 of The Amazing Spider-man ended December, 2012, on the 700th issue (Why did they end it? 300 issues till their 1,000th issue!). 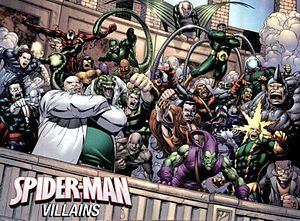 Spider-man’s villains are some of the most well known in all of comics and his first villain to appear is the Chameleon who debuted in The Amazing Spider-man (Vol. 1) #1. Rhino was the first villain that Steve Ditko was not responsible for as he was made by Stan Lee and John Romita Sr.
Spider-man can actually use both his spider-sense and reflexes to dodge automatic fire. Spider-man is weak to the pesticide ethyl chloride. 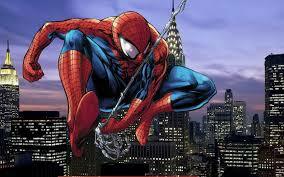 Spider-man can bench press 10 tons and has a top speed of 200 mph. In the comics, Peter actually didn’t meet Mary Jane nor Gwen Stacy until college! The original love triangle was between Peter Parker, Betty Brant, and fellow classmate Liz Allen. 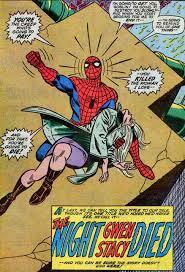 Gwen Stacy’s death marks the end of the Silver Age of Comics. Gwen Stacy’s one of the few dead comic book characters to remain dead. In 2007, Marvel released a four issue miniseries called Spider-man: Reign where a possible future for Peter Parker reveals that Mary Jane dies from cancer caused by Peter’s radioactive sperm. In the Ultimate Marvel Universe, Peter Parker took a bullet without hesitation and Captain America told him that he’ll be the greatest hero of them all. Unfortunately, the Ultimate Universe Peter Parker died. Fortunately, that allowed Miles Morales to take the role of the Ultimate Spider-man. In the storyline Superior Spider-man, Dock Ock took over Peter’s body and attempted to become a better Spider-man than Peter Parker. Of course you can never beat the original and Peter got his body back in the end. Spider-man has been part of superhero teams besides the Fantastic Four such as the Avengers, the Secret Defenders, and the Outlaws. When Wolverine died in Death of Wolverine, Spider-man replaced Wolverine’s title Wolverine and the X-Men with Spider-man and the X-Men. Spider-man is the destined teacher of Hope Summers, the ultimate mutant. This lead into Avengers Vs X-Men. 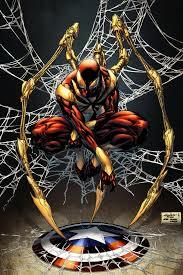 During the events of Marvel’s Civil War, Tony Stark invented a high tech spider suit dubbed the “Spider-armor” as a gift for Peter when he joined the pro-registration act. However, Peter quickly abandoned the suit when he left Tony to join Captain America. Speaking of Civil War, it has been confirmed that Tom Holland will play Spider-man in the MCU and has more than just a cameo in the movie. The first Spider-man movie in the MCU has been confirmed to NOT be an origin story. In Sam Raimi’s Spider-man movies, Spider-man possessed organic web shooters rather than mechanical ones. Toby Maguire, who played Spider-man in Sam Raimi’s Spider-man trilogy, insisted on a suit that would allow him to use the restroom without taking it off and going through the long refitting process. There has been a total of 8 Spider-man cartoons: Spider-man in 1967, Spider-man in 1981, Spider-man and His Amazing Friends in 1981, Spider-man: The Animated Series in 1994, Spider-man Unlimited in 1999, Spider-man: The New Animated Series in 2003, The Spectacular Spider-man in 2008, and the current show Ultimate Spider-man that started in 2012. Spider-man: The Animated Series actually received heavy censorship from Fox and thus there has only been three punches thrown within the entire season. In addition, references to killing was not allowed so villains would often say “destroy” instead of “kill” and characters would be sent to alternate dimensions instead of dying. In Spider-man: The Animated Series, Hobgoblin appeared before the Green Goblin as apposed to the comic books where the Green Goblin appeared first. This is because one of the creators was more interested in created toys from the series than the series itself and ended up created Hobgoblin action figures first. As a result, they had to do Hobgoblin first. 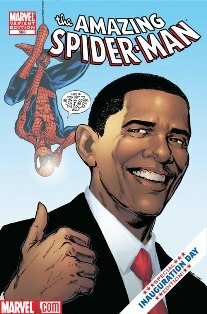 Spider-man is President Barack Obama’s favorite superhero. Spider-man is ranked #3 on IGN’s top 100 superheroes, right behind Batman at #2 and Superman at #1. So with Civil War on it’s way, which side do you choose for my next 50 Facts list? Captain America, or Iron Man! I think more comic writers need to read #16. I remember when the Webs actually could hold the Hulk. Nowadays they’re just portrayed as more of a nuisance. Everyone from Tombstone to Green Goblin just tears them up now. It can be argued that Spider Man just isn’t using enough web like he used too, but I’d say that writers simply underestimate him. I’ve always felt like strong characters like Hulk ahould be able to break out of it, but Green Goblin shouldn’t. Tombstone probably shouldn’t either. On top of that, everyone’s strengths tend to change throughout the decades. Some people have gotten stronger, other people have either gotten weaker or is just overshadowed by the new standards of strengths. Silver age Hulk shouldn’t be able to break out, but modern day Hulk should. Yes, some characters have definitely had a better time modernizing than others. Thor used to always be equal to Hulk in strength without the hammer so it was implied that with it he would win. Nowadays, Hulk is shown to be much stronger. I’d say that Spider Man suffered the Thor treatment as well. Seriously, everyone with the slightest amount of super strength keeps on breaking it in the comics. I do need to get back to them though, I haven’t read a comic in quite a while! My local library had bedbugs that contaminated the graphic novel section so I decided to give it a few weeks. Don’t want to take any chances! On the backburner I still have a few though so I just gotta work on those. Daily Bugle, not Daily Planet, dumbass. Daily Planet is DC not Marvel. HI Nate, great piece of knowledge here. I think people who only know Spider-Man from the movies would really enjoy reading this. The Spider-man universe is far more complex and interesting than what big audiences see in the movies. Hopefully, at some point, we will abandon the Peter Parker classic story and would move onto produce movies based on Spider-Man’s rich comic universe. Gives me chills. Anyway, read you later mate.